Question: What excites you most right now about things going on in Laos? (1) The government seems to be more open to the idea of Lao expats returning to Laos. It still remains to be seen what legislation they introduce to make this type of transition easier though. (2) All the new festivals that go on. Ever hear of the Lao Book Festival, the Lao Home and Living Show, or the Fang Mae Kong (an international dance festival)? Those are some new ones. (3) The increased tourism in Laos has meant greater interest in Lao culture as a whole. And that's very exciting from the perspective of this blog. I've seen a jump in visitors over the years. (4) In Laos, the number of internet users has increased so amazingly fast in just the last 5 years even. In particular, growth has been spurred by Lao Facebook users. (5) The growth of the middle class in Laos has been phenomenal, especially in the last 15 years. It's amazing to see people come out of poverty and cities develop. Of course there's lots of other exciting things going on in Laos but those are the first five things that come to mind. 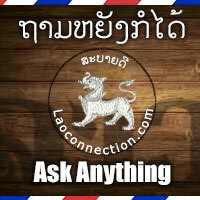 This is a part of the new ຖາມຫຍັງກໍໄດ້ Ask Anything Series here on Laoconnection.com where we're sharing the many questions people have asked us over the years from in-person conversations, email, Facebook, and the blog. For those wanting to add to the conversation, your comments below the posts are welcome. Feel free to make contact in Facebook to ask questions. Most people don't want their names published and that wish will be respected.